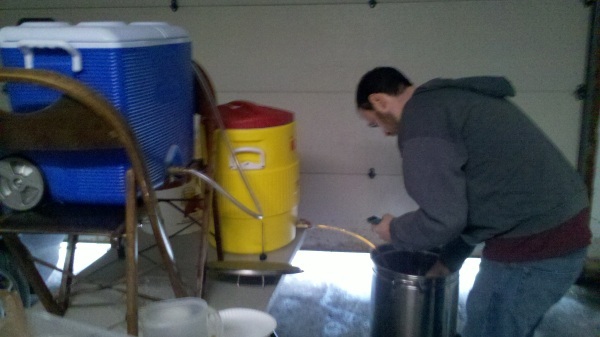 Erin and I are having a little get together in a couple weeks to celebrate our engagement (oh yeah, that happened) and my friend at work, George, offered to help me brew a batch of beer for the party. 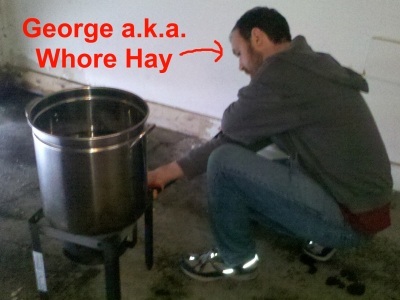 George (pronounced “Whore Hay”) is to home brewing what I am to home drinking. He knows more than I can ever hope to learn about brewing and it was a very educational experience spending the day freezing our asses off in his garage. Prior to meeting up, George asked what kind of beer I wanted to make. Having recently tasted Sierra Nevada’s fantastic holiday beer, Celebration Ale, I thought it would be a great beer to make. Fortunately, George actually found the EXACT recipe for the beer given by the Sierra Nevada brewers in a podcast. After a quick trip to the Adventures in Home Brewing store in Taylor, we had all the ingredients we needed. 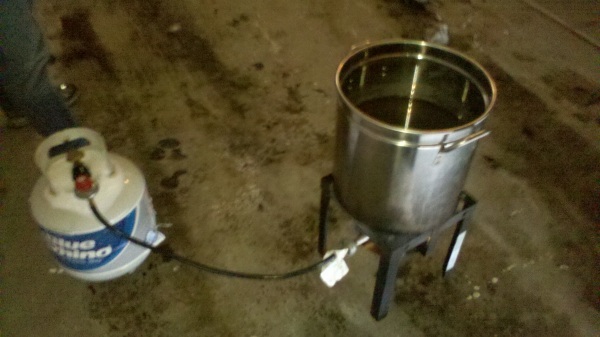 In order to brew the beer, we first had to heat the water using a propane powered burner. 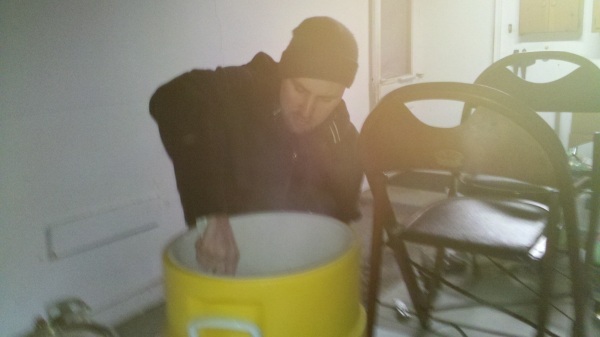 After that, we mixed the hot water with the grains in a cooler (the yellow one) we picked up from the store. We then had to let that sit for about an hour. During that time we set up another cooler (the blue one) with hot water. When the grains had sat for quite a while, we elaborately siphoned the grain soaked water (with all the sugar in it) back into the kettle. At the same time we were siphoning water from the blue cooler into the yellow cooler. This enabled us to get both the proper amount of water into the kettle and helped us get more sugar into the kettle (the sugar is what turns into alcohol). 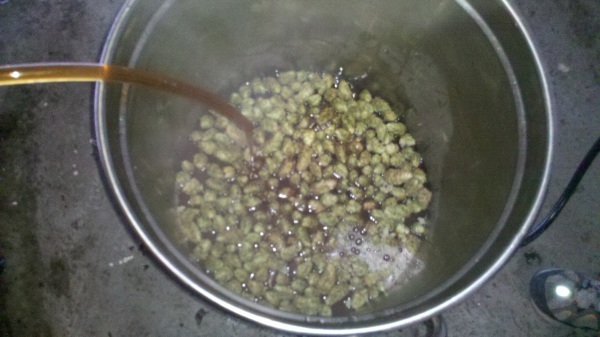 While the water (beer) was getting back into the kettle, we put in some more hops to add to the flavor. After allowing it to boil for about an hour and mixing in more hops, we then siphoned the beer into the carboy for it to ferment and added the yeast. 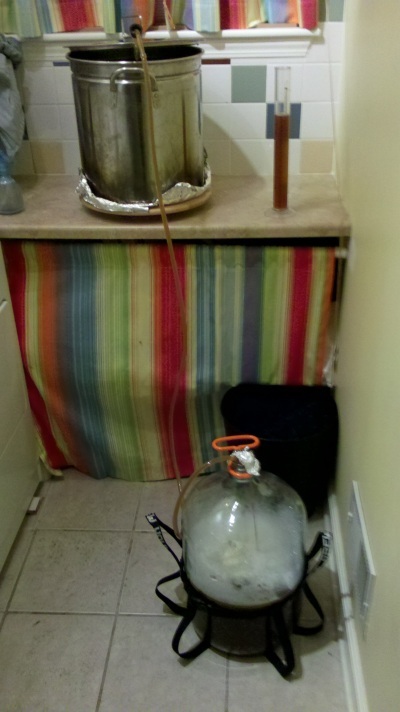 Finally, with all that done, we put the carboy (the primary fermenter) into the basement for fermenting. 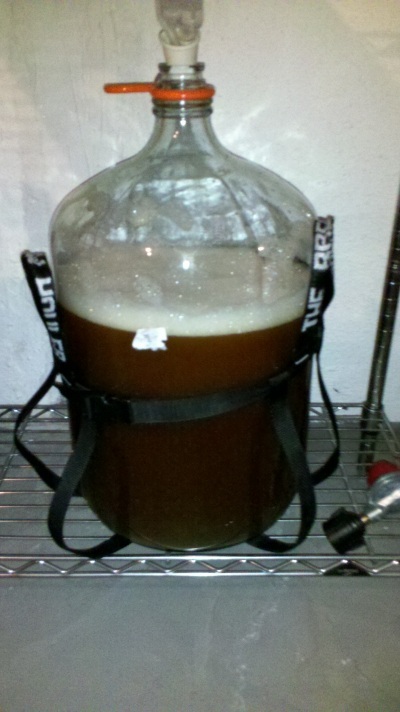 In about a week, George will move it to a secondary fermenter, and then a few weeks later to a keg for consumption. As I was running late to get home, George was even kind enough to clean up so I could hit the very snowy road. Clearly I owe him a large bottle of the first beer I brew at home (when I get to some home brewing). Things are slightly more complex than that and would require a lot more explanation than you have time for. Plus there’s a good amount of chemistry to it. You don’t really have to understand 100% of it to homebrew yourself, but it’s all very interesting to learn. Most importantly, the payoff is more beer. Or... you could just buy some at the new corner liquor store. Just a thought. But if I make my own, I'm even less likely to run out! We should get Whore Hay and Whinney ho together! Like the gate keeper and the key master! No that would be a bad idea. Very good idea. That should save the trouble of going down to the store every time I need a cold one.